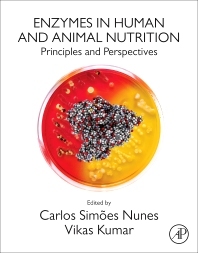 Enzymes in Human and Animal Nutrition is a detailed reference on enzymes covering detailed information on all relevant aspects fundamental for final use of enzymes in human and animal nutrition. Topics explored include selection, engineering and expression of microbial enzymes, effects of probiotics on enzymes in the digestive tract, potential new sources of enzymes, valorization of plant biomass by food and feed enzymes. Economics and intellectual property issues are also examined. Dr. Carlos Simões Nunes is a researcher with appointments at Estação Zootécnica Nacional in Fonte Boa, Portugal, and at INRA in France. He heads the Veterinary Department of Luena, Angola and manages cattle farms, slaughter houses and a fish farm in Angola. He has worked extensively in industry as Group leaders at Hoffmann-la-Roche and DSM and is Invited Professor at Nancy University in France. Dr. Vikas Kumar develops and teaches undergraduate and graduate courses in Aquatic Animal Nutrition. His research interest revolves around nutrition and physiology of fish and shellfish. The main aim of his research is to develop nutritionally balanced, environmentally sound and cost-effective diet for commercial fish and shellfish culture.